This is the ninth in a series of ten in which we meet one of the San Diego 10 orcas and hear from an advocate who continues to be one of the voices of these imprisoned voiceless, never stopping until the whole world listens. Kalia’s claim to fame is that she is also known as Great Grandbaby Shamu, being the granddaughter of the very first live orca born into captivity, Kalina (Keet’s mother; Keet was her first calf). A bill (AB 2140) is now being studied in the California legislature that would ban the park from breeding its captive orcas. The bill would also ban orca shows, ban captive breeding and prohibit the import and export of the so-called “killer” whales in California. Currently, SeaWorld San Diego is the only place in California where orcas are kept captive, with 10 currently held and profiled in this series. At present, the bill has been sent by an Assembly committee to “interim study,” a process used by the California Legislature to collect more information for complex bills, and will be considered again in the next legislative session (2015). Playful by nature, Kalia also has a dominant side that has shown up as she has matured – taking after her mother, Kasatka, the orca matriarch of SeaWorld San Diego. She has a tendency to put other orcas in their place. But after her mother gave birth to her younger half-brother, Makani, Kalia had mellowed out somewhat, until recently. Present at the birth of Kasatka’s fourth calf, Makani, Kalia spends a great time with him, learning how to take care of a calf. So far, because of being so close to her mother and baby brother it looks like Kalia has good mothering tendencies. That is the hope. But the bigger hope is that no other youngsters in captivity will have to be force-fed motherhood ever again. As we have reported time and time again in this series, the prognosis for orca babies born from such young mothers, as well as the mental and physical health of the mother, is dismal. It’s a death sentence waiting to happen to these youngsters. According to the Whale and Dolphin Conservation Society, there are approximately 42 orcas known to be held captive worldwide. 137 orcas were captured from the wild starting in 1961 and 91 percent of them are now dead, ranging in age from one day to 28 years old, with the median survival age, four years old (3 of the 13 survivors are here in San Diego). According to orca scientist Dr. Naomi Rose, male Orcas in the wild live an average of thirty years, the maximum being fifty to sixty years whereas, females in the wild average living to the age of 46 with a maximum age of eighty to ninety years. There have been 32 Orcas born in captivity and died, excluding stillbirths; 156 have died in captivity including stillbirths and miscarriages. You can see the frustration that Kalia feels at present being in confinement, prematurely impregnated, her life at the mercy of an unnatural world that defies everything an orca in the wild would ever experience. Within our advocate, Liz Jacobelly’s profile following, you will see a link to a video of Kalia looking like she is having a breakdown. Slamming her head over and over again she is communicating sheer anguish over her circumstances. You want to cry along with her, and take her away from there forever. “I started when I was in high school volunteering at Children’s Convalescent Hospital with children that had severe mental and physical disabilities. From there I visited people with AIDS in the hospital. I would go in and visit each person at the hospital and be an ear for them to talk to or just even hold their hand. “… to those non-humans who do not have a voice. Animals communicate but most people do not listen. After watching an undercover video on factory farming I became vegan. The thought that these animals are not only killed for our food but also suffer unspeakable abuse is appalling. “I spend my spare time doing vegan outreach to educate others about the cruelties that farm animals suffer. I also spoke out to close Casa Beach during pupping season. I also speak out for mother dogs in mass breeding puppy farms that have their puppies taken away and shipped off to pet stores. One recent campaign I was involved in was the Ordinance to ban stores that sell puppies, kittens and rabbits in San Diego. I found that it is all about profit for those involved in this cruel industry and for many of those government, city and county decision makers that will not pass laws to protect the animals. 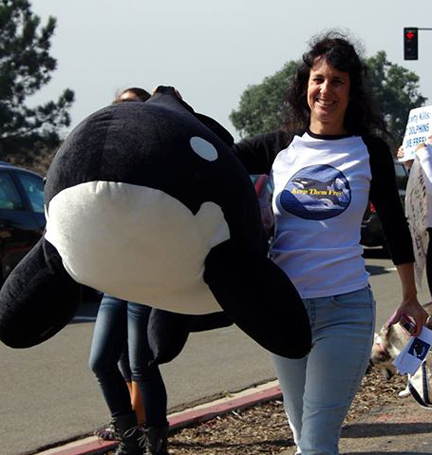 “Now I am dedicated to speaking out for the 10 orcas at SeaWorld so they may be released and rehabilitated to sea pens. “When I was young I went to SeaWorld and loved watching the Shamu show. I thought it was so much fun for the orcas. I will never forget after one of the shows I witnessed Shamu in the small tank in back. I wondered how he could swim or turn around. What SeaWorld taught me at that young age was it was alright for a killer whale to live in a small tank. “Now as an adult I realize that it is wrong for any animals to be confined to small enclosures. I learned that orcas swim up to 100 miles a day and live in family groups called pods. The orcas that were caught in the wild were taken away from their families and put in with orcas from different cultures and areas. I also learned that they are used for breeding so another baby Shamu can bring money and customers to the park. “In captivity most calves are taken away from their mothers where in the wild they would stay together for life. I’m among the majority of families who don’t want to patronize a park that teaches kids it’s acceptable to use and abuse another species for entertainment. Watching a dolphin jump through a hoop or an orca splash and do tricks is not educational. It is not conservation and it is not ethical. “As an advocate for Kalia, it breaks my heart that she has never known what it is like to be free in the wild. Kalia is pregnant at only 9 years old, when in the wild orcas do not mature and start mating until age 14 or 15. This could be a life threatening situation for her. She will be giving birth to this calf and will most likely be separated from her mother or her calf or both. If you are a mother or father, you can understand the grief that these mother orcas go through when their babies are taken away from them to send to another park. There is a recent wrenching video of Kalia showing her having a tantrum (As seen in this link below.) It’s heartbreaking witnessing her deep frustration to not be able to live the life that she deserves. “When is holding these highly intelligent social cetaceans in captivity going to stop? CALL TO ACTION: Sea Shepherd is asking supporters to send polite comments to the National Aquarium encouraging them to move forward with their plans to close their “Dolphin Discovery” exhibit and relocate the dolphins to a sanctuary. There’s an interesting story about a volcanic lake in Honduras. Long ago aquarists were taking many of the unique specifies of fish out of the lake for their tanks. Environmentalists got up in arms about this and worked to protect the lake. While deliberations about making this lake into a park were taking place the volcano sprang to life and boiled everything in the lake. All life in the lake went extinct. Fortunately aquarists had preserved the unique species and they were introduced to other lakes and preserved. An event like a Fukushima could easily obliterate all killer whales in an ocean and the only remaining specimens would be found in sanctuaries like Sea World. Furthermore, a small body of water, like a lake, is much more vulnerable to pollution because the water is not circulated as much. The ocean can handle higher levels of pollution, even though we shouldn’t be dumping our garbage and waste into it. SeaWorld has contributed to local pollution and has been cited multiple times for polluting Mission Bay. SeaWorld caused the Southern Resident killer whale population to become endangered from their captures in the 70s. SeaWorld hasn’t spoken out against the slaughter in Taiji. They haven’t taken responsibility for anything. Furthermore, SeaWorld’s killer whale “collection” cannot be completely reintroduced into the wild; genes from different geographic locations that would never come into contact with each other in the wild have been mixed, killer whales have been inbred, and then we have the problem that most orcas are captive born and have never tasted the ocean. Martha brings up a good point; orcas do not only live in the Pacific ocean, but all of the world’s oceans. SeaWorld has opposed the building of coastal orca sanctuaries. SeaWorld is an aquarium not a sanctuary. Stucky, what makes you think WE humans would survive an event that obliterates all orca, which live in the Pacific and Atlantic Oceans as well as the North and Baltic Seas? Any number of viral ailments could wipe out all Orcas. Their worldwide population is so small that they could easily make it to the extinct list. Seriously? Your argument for captivity is that the worldwide population of orca could be wiped out by viral ailments that orca have managed to elude for millenia? You realize that the death rate for orca in captivity is much higher, right? The average lifespan is 4 years, since we first started capturing them and keeping them captive in 1961. 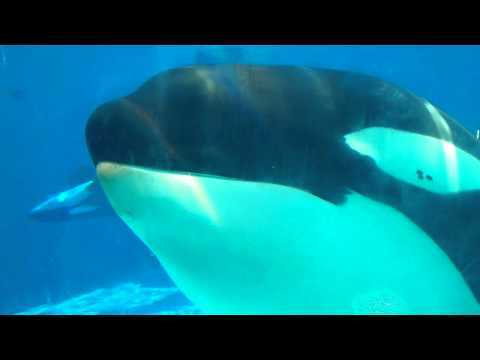 It is sad that Kalia is only 9 years old and is already pregnant…truly heartbreaking and goes to show $eaWorld is in it for the money! I stand corrected — orca live in every ocean! “Killer whales are found in all oceans and most seas. Due to their enormous range, numbers, and density, distributional estimates are difficult to compare, but they clearly prefer higher latitudes and coastal areas over pelagic environments. Systematic surveys indicate the highest densities of killer whales (>0.40 individuals per 100 km²) in the northeast Atlantic around the Norwegian coast, in the north Pacific along the Aleutian Islands, the Gulf of Alaska and in the Southern Ocean off much of the coast of Antarctica. They are considered “common” (0.20–0.40 individuals per 100 km²) in the eastern Pacific along the coasts of British Columbia, Washington and Oregon, in the North Atlantic Ocean around Iceland and the Faroe Islands. High densities have also been reported but not quantified in the western North Pacific around the Sea of Japan (in very limited areas), Shiretoko Peninsula and off Kushiro (Resident and Transient groups began colonizing in these areas possibly after in 2000s), Sea of Okhotsk, Kuril Islands, Kamchatka and the Commander Islands and in the Southern Hemisphere off the coasts of South Australia, Patagonia, off the coast of southern Brazil and the tip of southern Africa. They are reported as seasonally common in the Canadian Arctic, including Baffin Bay between Greenland and Nunavut, and around Tasmania and Macquarie Island. Information for offshore regions and tropical waters is more scarce, but widespread, if not frequent, sightings indicate the killer whale can survive in most water temperatures. They have been sighted, for example, in the Mediterranean, the Arabian Sea, the Gulf of Mexico and the Indian Ocean around the Seychelles. A distinct population may exist in Papua New Guinea. “Probably the largest population lives in Antarctic waters, where they range up to the edge of the pack ice and are believed to venture into the denser pack ice, finding open leads much like beluga whales in the Arctic. In contrast, killer whales are seasonal summer visitors to Arctic waters, where they do not approach the ice pack. With the rapid Arctic sea ice decline in the Hudson Strait, their range now extends deep into the northwest Atlantic. Various areas in coastal New Zealand are home to many friendly, ray-hunting Orcas. ” http://en.wikipedia.org/wiki/Killer_Whale. Thank you for this article Liz, and for all the work you do! Blessings to you and Kalia. . . and captive cetaceans everywhere. Just because Ulises ‘may have’ mated with Kalia is no reason for Sea World to then go ahead and artificially inseminate her at such a young age. It’s deplorable. Poor excuse to inseminate Kalia, if we are to even believe what Sea World says actually happened. You are a tried-and-true activists, Liz and are very much appreciated! Thank you Cara-Wilson-Granat for another informative piece.